Do You Own a Wheel house? We offer easy access to the lake and we can refill your LP tanks as well. 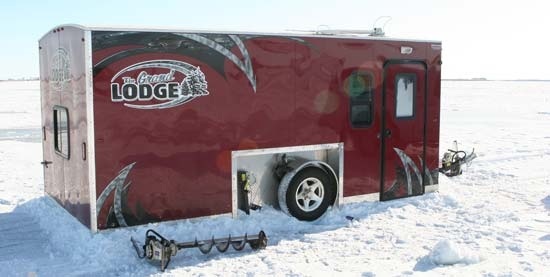 Our winter ice access provides some of the best Red Lake Ice fishing services found on Upper Red Lake. Want your own private road plowed for your group of friends? We specialize in going the extra mile to make our customers happy. Large groups or small; JR's Red Lake Access provides the same quality of service. Don't forget to visit our bar once the fishing is over. There's always plenty of fun at JR's Red Lake Access. Read below to learn more about the Red Lake Ice fishing opportunities that our Red Lake ice fishing access has to offer. Want to get away from the rest of the fishermen? We can plow your group a private road off one of our many established ice roads on the lake. Want a private spur plowed for a single ice house? We can do that too. No group is too big or too small. Learn more about the types of private ice roads we provide to wheelhouse owners by clicking HERE. We carry a full line of quality live bait at JR's Corner Access. Whether you're planning on fishing for walleye, crappie, or northern pike; we have the live bait that will fit your need. Learn more about the types of live bait that JR's Red Lake Access carries by clicking HERE.